Once upon a time . . . in a splendid palace on the bed of the bluest ocean, lived the Sea King, a wise triton. He lived in a magnificent palace, built of gaily coloured coral and seashells,together with his five daughters, very beautiful mermaids. Sirenetta, the youngest and loveliest of them all, also had a beautiful voice, and when she sang, the fishes flocked from all over the sea to listen to her. The shells gaped wide, showing their pearls and even the jellyfish stopped to listen. The young mermaid often sang, and each time, she would gaze upwards, seeking the faint sunlight that scarcely managed to filter down into the depths. "Oh, how I'd love to go up there and at last see the sky, which everyone says is so pretty, and hear the voices of humans and smell the scent of the flowers!" "You're still too young!" said her mother. "In a year or two, when you're fifteen. Only then will the King let you go up there, like your sisters!" Sirenetta spent her time wishing for the world of humans, she listened to her sisters' stories, and every time they returned from the surface, she would ask them questions, to satisfy her curiosity. And as she waited for the day when she too would be allowed to reach the surface of the sea and meet the unknown world, Sirenetta spent her time in her wonderful sea garden. The sea horses kept her company, and sometimes a dolphin would come and play. Only the unfriendly starfish never replied when she called. At last, her long desired birthday came. The night before, Sirenetta could not sleep a wink. In the morning, her father called her and, stroking her long hair, slipped a lovely carved flower into her locks . . . "There ! Now you can go to the surface. You'll breathe air and see the sky. But remember! It's not our world! We can only watch it and admire! We're children of the sea and have no soul, as men do. Be careful and keep away from them; they can only bring bad luck!" In a second, Sirenetta had kissed her father and was darting smoothly towards the surface of the sea. She swam so fast with flicks of her slender tail, that even the fish could not keep up with her. Suddenly she popped out of the water. How wonderful! For the first time, she saw the great blue sky, in which as dusk began to fall, the first stars were peeping out and twinkling. The sun, already over the horizon, trailed a golden reflection that gently faded on the heaving waves. High overhead, a flock of gulls spotted the little mermaid and greeted her arrival with shrieks of pleasure. "It's so lovely!" she exclaimed happily. But another nice surprise was in store for her: a ship was slowly sailing towards the rock on which Sirenetta was sitting. The sailors dropped anchor and the ship swayed gently in the calm sea. Sirenetta watched the men go about their work aboard, lighting the lanterns for the night. She could clearly hear their voices. "I'd love to speak to them!" she said to herself. But then she gazed sadly at her long flexible tail, her equivalent of legs, and said to herself: "I can never be like them!" Aboard ship, a strange excitement seemed to seize the crew, and a little later, the sky became a spray of many coloured lights and the crackle of fireworks filled the sky. "Long live the captain! Hurray for his 20th birthday. Hurray! Hurray . . . many happy returns!" Astonished at all this, the little mermaid caught sight of the young man in whose honor the display was being held. Tall and dignified, he was smiling happily, and Sirenetta could not take her eyes from him. She followed his every movement, fascinated by all that was happening. The party went on, but the sea grew more agitated. Sirenetta anxiously realized that the men were now in danger: an icy wind was sweeping the waves, the ink black sky was torn by flashes of lightning, then a terrible storm broke suddenly over the helpless ship. In vain Sirenetta screamed: "Look out! Beware of the sea . . ."
But the howling wind carried her words away, and the rising waves swept over the ship. Amidst the sailors' shouts, masts and sails toppled onto the deck, and with a sinister splintering sound, the ship sank. By the light of one of the lamps. Sirenetta had seen the young captain fall into the water, and she swam to his rescue. But she could not find him in the high waves and, tired out, was about to give up, when suddenly there he was on the crest of a nearby wave. In an instant, he was swept straight into the mermaid's arms. 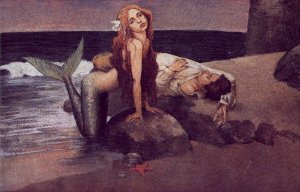 The young man was unconscious and the mermaid held his head above water in the stormy sea, in an effort to save his life. She clung to him for hours trying to fight the tiredness that was overtaking her. Then, as suddenly as it had sprung up, the storm died away. In a grey dawn over a still angry sea, Sirenetta realized thankfully that land lay ahead. Aided by the motion of the waves, she pushed the captain's body onto the shore, beyond the water's edge. Unable herself to walk, the mermaid sat wringing her hands, her tail lapped by the rippling water, trying to warm the young captain with her own body. Then the sound of approaching voices startled Sirenetta and she slipped back into deeper water. "Come quickly! Quickly!" came a woman's voice in alarm. "There's a man here! Look, I think he's unconscious!" The captain was now in good hands. "Let's take him up to the castle!" "No, no! Better get help . . ." And the first thing the young man saw when he opened his eyes again was the beautiful face of the youngest of a group of three ladies. "Thank you! Thank you . . . for saving my life . . . he murmured to the lovely unknown lady. From the sea Sirenetta watched the man she had snatched from the waves turn towards the castle, without knowing that a mermaid had saved his life. Slowly swimming out to sea, Sirenetta felt that there on the beach she had left behind something he could never bring herself to forget. How wonderful those tremendous hours in the storm had been, as she had battled with the elements. And as she swam down towards her father's palace, her sisters came to meet her, anxious to know what had kept her so long on the surface. Sirenetta started to tell her story, but suddenly a lump came to her throat and, bursting into tears, she fled to her room. She stayed there for days, refusing to see anyone or to touch food. She knew that her love for the young captain was without hope, for she was a mermaid and could never marry a human. Only the Witch of the deeps could help her. But what price would she have to pay? Sirenetta decided to ask the Witch. . ". . . so you want to get rid of your fishy tail, do you? I expect you'd like to have a pair of woman's legs, isn't that so?" said the nasty Witch scornfully, from her cave guarded by a giant squid. "Be warned!" she went on. "You will suffer horribly, as though a sword were cutting you apart. And every time you place your feet on the earth, you will feel dreadful pain!" "It doesn't matter!" whispered Sirenetta, with tears in her eyes. "As long as I can go back to him!" "And that's not all!" exclaimed the Witch. "In exchange for my spell, you must give me your lovely voice. You'll never be able to utter a word again! And don't forget! If the man you love marries someone else, you will not be able to turn into a mermaid again. 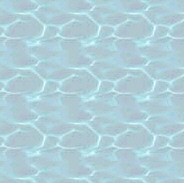 You will just dissolve in water like the foam on the wave!" "All right!" said Sirenetta, eagerly taking the little jar holding the magic potion. The Witch had told Sirenetta that the young captain was actually a prince, and the mermaid left the water at a spot not far from the castle. She pulled herself onto the beach, then drank the magic potion. An agonizing pain made her faint, and when she came to her senses, she could mistily see the face she loved, smiling down at her. The witch's magic had worked the spell, for the prince had felt a strange desire to go down to the beach, just as Sirenetta was arriving. There he had stumbled on her, and recalling how he too had once been washed up on the shore, gently laid his cloak over the still body, cast up by the waves. "Don't be frightened! he said quickly. "You're quite safe! Where have you come from?" But Sirenetta was now dumb and could not reply, so the young man softly stroke her wet cheek. "I'll take you to the castle and look after you," he said. In the days that followed, the mermaid started a new life. She wore splendid dresses and often went out on horseback with the prince. One evening, she was invited to a great ball at Court. However, as the Witch had foretold, every movement and each step she took was torture. Sirenetta bravely put up with her suffering, glad to be allowed to stay near her beloved prince. And though she could not speak to him, he was fond of her and showered kindness on her, to her great joy. However, the young man's heart really belonged to the unknown lady he had seen as he lay on the shore, though he had never met her since, for she had returned at once to her own land. Even when he was in the company of Sirenetta, fond of her as he was, the unknown lady was always in his thoughts. And the little mermaid, guessing instinctively that she was not his true love, suffered even more. She often crept out of the castle at night, to weep by the seashore. Once she thought she could spy her sisters rise from the water and wave at her, but this made her feel sadder than ever. Fate, however, had another surprise in store. From the Castle ramparts one day, a huge ship was sighted sailing into the harbour. Together with Sirenetta, the prince went down to meet it. And who stepped from the vessel, but the unknown lady who had been for long in the prince's heart. When he saw her, he rushed to greet her. Sirenetta felt herself turn to stone and a painful feeling pierced her heart: she was about to lose the prince for ever. The unknown lady too had never forgotten the young man she had found on the beach and soon after, he asked her to marry him. Since she too was in love, she happily said "yes". A few days after the wedding, the happy couple were invited for a voyage on the huge ship, which was still in the harbour. Sirenetta too went on board, and the ship set sail. Night fell, and sick at heart over the loss of the prince, Sirenetta went on deck. She remembered the Witch's prophecy, and was now ready to give up her life and dissolve in the sea. Suddenly she heard a cry from the water and dimly saw her sisters in the darkness. ". . . Sirenetta! Sirenetta! It's us . . . your sisters! We've heard all about what happened! Look! Do you see this knife? It's magic! The Witch gave it to us in exchange for our hair. Take it! 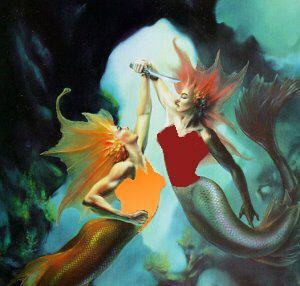 Kill the prince before dawn, and you will become a mermaid again and forget all your troubles!" As though in a trance, Sirenetta clasped the knife and entered the cabin where the prince and his bride lay asleep. But as she gazed at the young man's sleeping face, she simply blew him a furtive kiss, before running back on deck. When dawn broke, she threw the knife into the sea. Then she shot a parting glance at the world she was leaving behind, and dived into the waves, ready to turn into the foam of the sea from whence she had come, and vanish. "Sirenetta, Sirenetta! Come with us ..."
"Who are you?" 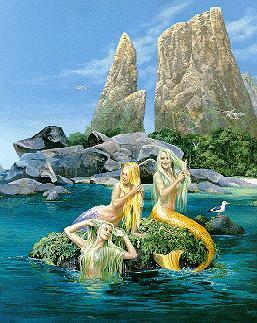 asked the mermaid, surprised to find she had recovered the use of her voice. "Where am I?" "You're with us in the sky. We're the fairies of the air! We have no soul as men do, but our task is to help them. We take amongst us only those who have shown kindness to men!" "Look! The earth flowers are waiting for our tears to turn into the morning dew! Come along with us ..."